The volume entitled Commentarii Collegii Conimbricensis Societatis Iesu. 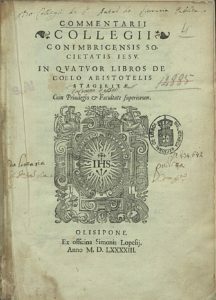 In Quatuor libros de Coelo Aristotelis Stagiritae belongs to the second phase of publication of the Coimbra Jesuit Aristotelian Course, viz. one year after the volume on Physics. With the exception of the volume of the Dialectica, all the titles reproduce in their cover the same logo of the Society of Jesus, in where the Latin motto, “Nomen Domini Turris Fortissima”, is read. This second phase includes also the volumes on Parva Naturalia and Meteororum since all the three titles were presented as a whole to the examination of four Inquisition Censors, Bartolomeu Ferreira, Nicolau Pimenta, Luís de Sotomaior and Rodrigo Góis. It is to be noticed that, in this second phase, the editorial process takes place one year after the first one. As happens with almost all the titles pertaining to the Coimbra Jesuit Aristotelian Course, the authorship of the Coimbra Commentary On the Heavens is assigned to the Portuguese Jesuit Manuel de Góis (1543-1597) but the volume was published in Lisbon, at Simão Lopes’ Printing House (230x170mm), in the year 1593. What has been said in the equivalent introduction concerning the volume on Physics, regarding a possible earlier date for Góis’ redaction of the volume On the Heavens, is to be taken into consideration now. As to the pace of the edition, the earliest date mentioned in the volume is September 2nd, 1592. As well as reproducing the brief version of the King’s License, in this volume is also printed a larger version of the King’s Privilege (Alvará), both written in Portuguese language, the latter giving the date of September, 19th and explicitly mentioning the name of the King’s amanuensis, Domingos Roiz. Here it is read: (i) the King, Philip I (II of Spain), was informed by the Rector and the members of the Coimbra Jesuit College that the Arts Course was in the Press, and one volume of Philosophy already published with the necessary required licenses [i.e. the volume on Physics published in 1592]; (ii) the Commentaries on the four books On the Heavens, on Meteorology and the Parva Naturalia, with the Latin translation of the Aristotelian text, were to be published, after the appreciation by the Inquisition and the Bishop. In fact, according to the dates mentioned, on September 2nd, 1592, the Archbishop of Lisbon, D. Miguel de Castro, had fulfilled his duty; and on the 24th, three members of the Council of the Inquisition, namely, António de Mendonça, Jacob de Sousa and Marcos Teixeira signed their final permission, since the other four censors already mentioned, working on behalf of the Cardinal Prince Albert, the General Inquisitor of Portugal, have given their positive judgement. Probably, after dividing (partim) their reading task, Bartolomeu Ferreira (Professor of Holy Scripture and Books Censor), Dr Nicolau Pimenta, Luis de Sotomaior (Theology Professor), and Rodrigo Góis they all agreed, as usually stated, that the Commentaries “On the Heavens, with the Latin translation, the Parva Naturalia and on Aristotle’s Meteorology” defend “nothing that could be alien to faith or good conduct”, have “a sound doctrine, and philosophical erudition”, and are highly useful to the study of the liberal arts. Of all these names, a special reference can be made to Luís de Sotomaior (1526-1610), Vice-Rector of the University of Coimbra, with a lecturing experience in Oxford, Cambridge, Flandres and in Germany, as well as one of the Portuguese representatives at the Council of Trent. In its editio princeps, the Commentarii Collegii Conimbricensis Societatis Iesu. In Quatuor libros de Coelo Aristotelis Stagiritae does not print the Aristotelian Greek text – contrary to what sometimes is read, it is to be noted that never that occurs – and is published with a small Appendix (pp. 533-558) entitled, Tractatio aliquot Problematum ad quinque sensus spectantium per totidem sectiones distributa (“A Treatise on the Problems Related to the Five Senses divided by the same number of sections”) as well as an extensive Index of Subjects (pp. 421-447) and, at its beginning, with an Index of the Questions of the four books On the Heavens. By the number of its pages (453pp), this volume is the fifth of the Coimbra Jesuit Aristotelian Course, immediately following the volume On Generation and Corruption.